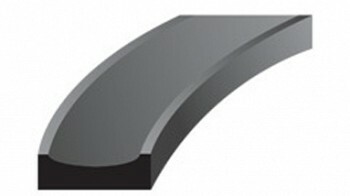 Contoured back-up rings are used in both dynamic and static sealing environments as anti-extrusion devices. They can also be used when mating part clearances are not controlled tightly. In both cases, they are capable of extending the useful life of O-Rings. The contoured back-up ring has a slightly concave face on one side, which provides uniform contact with the O-Ring’s entire diameter. The sizes correspond to AS568 O-Rings. Using two back-up rings is recommended whenever possible, even in single-acting applications. The stock material is 90 durometer nitrile and the temperature range is -40ºF to +250ºF.